I’ve never been one to field that much of an interest into cats, but second to dogs, they are perhaps the most domesticated animals we know and love. .Pretty Kitty is a 5 reel online slot game in which you must match various breeds of feline creatures, along with gemstones and collars to earn some riches and the respect of the aristocats. For the past 20 years Microgaming has been at the forefront of online casino gaming, which is probably why you can’t talk about online casino gambling without the name Microgaming coming up. Claiming to be the first firm that built an online casino, this games developer has changed the way we have gambled forever. And even though they are one of the oldest companies around, their games are still fresh and innovative and constantly being updated so that you have the most cutting-edge technology and graphics in your online casino games. 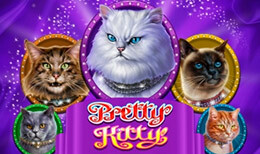 Pretty Kitty is a progressive online slot game centred around your pampered feline friends. This game will wake up the cat lover inside of you as you follow the show cats through their adventures as you spin the reels. There are 5 reels, 3 rows and 243 paylines in the online slot game, the reels are set onto a background of lush red or rich purple velvet that shines brightly all over the screen. The reels are framed in gold giving you that feeling of luxury and exclusivity. Games start at 30p up to £75 per spin. In Pretty Kitty, the high value symbols are the fancy cats and the low value symbols are your different coloured gemstones. The 5 different cat symbols can appear stacked at any time and cover entire reels at once. For example, if you have a White Cat symbol stacked on reel 1, it will expand on the other reels that a White Cat is on. This Expanding Symbols feature is also present in the Free Spins game. The Pretty Kitty game logo is the Wild in this online slot game and it will substitute for all symbols in the game except for the Scatter. The Wild can also create its own winning combinations, not only when it substitutes in a win. If a full stack of Wilds appears on reel 1, all other Wilds on other reels will expand creating even more winning combinations and huge jackpots for you to take home. The Diamond Collar is the Scatter symbol and 3 of these symbols on the reels will reward you with 15 free spins in the Free Spins feature. You can also retrigger the Free Spins feature when you land 3 more Scatters in the Free Spins game, you will be rewarded a further 15 free spins, up to 30 in total. Pretty Kitty will appeal to any animal lover out there with this furry theme and classic and straightforward game play. It’s not all cuteness here, there are some impressive winnings to be won with the Free Spins which can be retriggered and the Stacked Wilds that Expand. There is a lot to be won with this delightful progressive online slot and once you have given it a try you will definitely come back to play again.